Bad luck seems to come to those who naively try to help the Zionists make peace when the reality is the Zionists do not want peace! Is there a pattern here? The words of the editors of the Jewish Press show themselves for what they really are. Ingrates! When Prime Minister Netanyahu sent out for his meeting last Tuesday with President Clinton, he had been warned to expect the worst. He had been told that he would get a "no frills" reception (no lunch or use of Blair House as a guest -- the opposite was true for Arafat) and to be prepared for some really rough treatment from Mr. Clinton. And, from all reports, he was not misinformed. For weeks, an obvious Clinton Administration orchestrated media attack had conditioned public opinion. News stories circulated about how President Clinton was furious with the recalcitrant Netanyahu who had caused the breakdown of negotiations between Israel and the Palestinians. Other stories quoted Clinton aides as saying that the president planned to show his displeasure with Mr. Netanyahu at their upcoming meeting and to follow up with some forceful intimidation. And we all remember President Clinton's infamous snub of the Prime Minister last month. 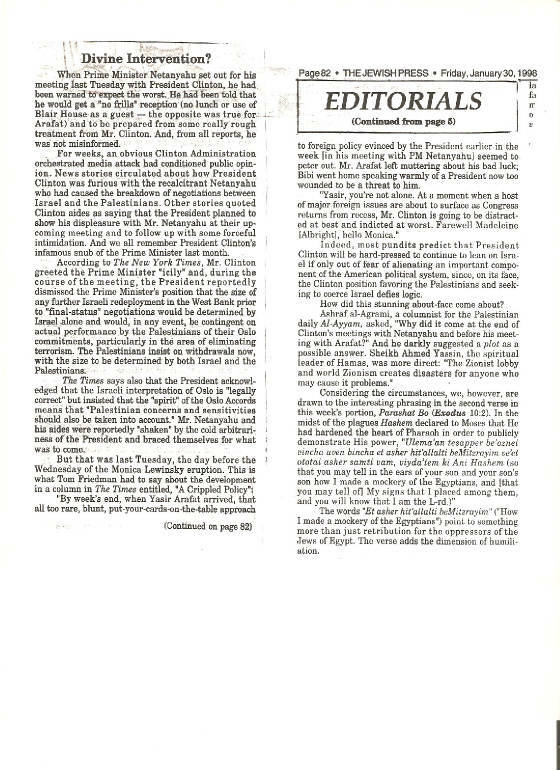 According to The New York Times, Mr. Clinton greeted the Prime Minister "icily" and, during the course of the meeting, the President reportedly dismissed the Prime Minister's position that the size of any further Israeli redeployment in the West Bank prior to "final-status" negotiations would be determined by Israel alone and would, in any event, be contingent on actual performance by the Palestinians of their Oslo commitments, particularly in the area of eliminating terrorism. The Palestinians insist on withdrawal now, with the size to be determined by both Israel and the Palestinians. The Times says also that the President acknowledged that the Israeli interpretation of Oslo is "legally correct" but insisted that the "spirit" of the Oslo Accords means that "Palestinian concerns and sensitivities should also be taken into account." Mr. Netanyahu and his aides were reportedly "shaken" by the cold arbitrariness of the President and braced themselves for what was to come. "By week's end, when Yasir Arafat arrived, that all too rare, blunt, put-your-cards-on-the-table approach to foreign policy evinced by the President earlier in the week [in his meeting with PM Netanyahu] seemed to peter out. Mr. Arafat left muttering about his bad luck; Bibi went home speaking warmly of a President now too wounded to be a threat to him. "Yasir, you're not alone. At a moment when a host of major foreign issues are about to surface as Congress returns from recess, Mr. Clinton is going to be distracted at best and indicted at worst. Farewell Madeleine [Albright], hello Monica." Indeed, most pundits predict that President Clinton will be hard-pressed to continue to lean on Israel if only out of fear of alienating an important component of the American political system, since, on its face, the Clinton position favoring the Palestinians and seeking to coerce Israel defies logic. How did this stunning about-face come about? Ashraf al-Agrami, a columnist for the Palestinian daily Al-Ayyam, asked, "Why did it come at the end of Clinton's meetings with Netanyahu and before his meeting with Arafat?" And he darkly suggested a plot as a possible answer. Sheikh Ahmed Yassin, the spiritual leader of Hamas, was more direct: "The Zionist lobby and world Zionism creates disasters for anyone who may cause of problems." Considering the circumstances, we, however, are drawn to the interesting phrasing in the second verse in this week's portion, Parashat Bo (Exodus 10:2). In the midst of the plagues Hashem declared to Moses that He had hardened the heart of Pharoah in order to publicly demonstrate His power, "Ulema'an tesapper be'oznei vincha uven bincha et asher hit'allalti beMitzrayim ve'et ototai asher samti vam, viyda'tem ki Ani Hashem (so that you may tell in the ears of your son and your son's son how I made a mockery of the Egyptians, and [that you may tell of] My signs that I placed among them, and you will know that I am the L-rd.)" The words "Et asher hit'allalti beMitzrayim" ("How I made a mockery of the Egyptians") point to something more than just retribution for the oppressors of the Jews of Egypt. The verse adds the dimension of humiliation.